Sometimes people just stop liking you. You can’t change it, fix it or even know why. All you can do is let them go, don’t yield to the temptation to reach out. Learn to move on. There’s a lot more that can be said but it all comes down to the same thing: Accept and learn to move on. It’s been a really good week, both RL and SL. I bought my son a car in RL. It was nearly as easy as buying one in SL, but nowhere near as inexpensive. And he’s already run his first EZPass because he forgot his car doesn’t have one. Yet. /me makes note to self. Work is going well – lots of positive conversations and feedback. Lovely RL indulgence on Thursday (none of your business 🙂 ). Seeing friends. 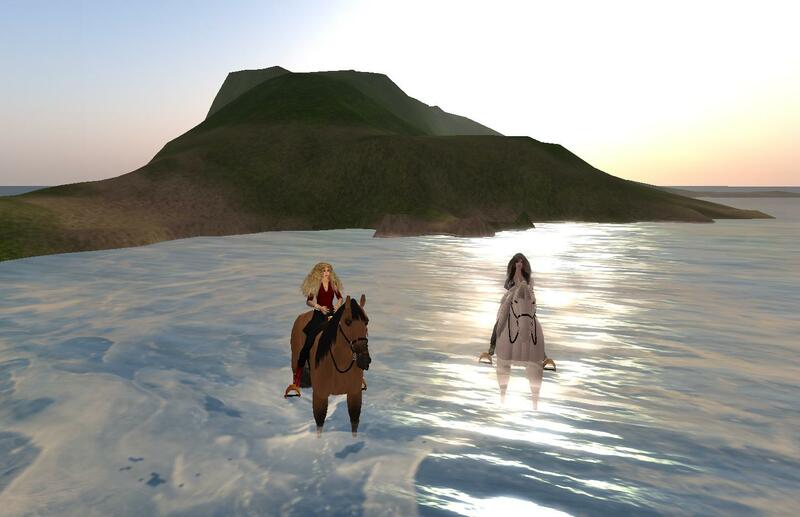 And in SL – oh wow – seeing friends BIG TIME!!!! I was back at the Crown and Pearl not once but TWICE!!!! OMG – How I have missed that place and those people. I had a hilarious morning with Calli – that’s the post I actually have half-written. 🙂 It’s coming, I promise. She finds the best toys. I went dancing with another friend at the kind of place and kind of outfit that I simply can’t mention on this blog. 🙂 Oops. I discovered Midnight Mania boards and got a Red Succubus War Queen outfit. *grin* Yes, there ARE pictures out there. I could NOT resist trying it on. I LOVE it. 🙂 I’m sure if you offer enough, one of my dear friends will betray me. 🙂 Make ME an offer. Dale and I went to a great little party. We rode a carriage and danced and chatted and laughed. I should probably post THAT, too. And I got some good work accomplished the last 2 days – built a platform for the latest demo, accessorized it, “acquired” a teleport script to move us from the office to the sky platform (you have to love Google and people who want to share their scripts). I think, however, that there is a storm cloud on the horizon. I have a strong suspicion that my next-door neighbor wants to buy my property. I logged in this morning to find a “I HAVE to talk to you IM”. And since we don’t ever talk, and since she’s been doing extensive remodelling….. well, that’s what I think. Sigh. You KNOW how bad I am at decisions. And I love my property. Where would I go? But right now…. RL is calling – have a brunch to attend. Where the chef is phenomenal and so many good friends will be there. So my blogging must wait yet again. And I MISS Oura, who is away for a few days. So after all my running about yesterday (scripting, Noma concert, CnP, MM boards, buying new hair), I went to Oura’s and relaxed in her chair and missed her. We were both having a hectic week. A lot to do, deadlines, not much time. The beauty of living in a virtual world is that it takes no time to commute. We can say – I have 15 minutes now – do you? And if the answer is yes, well, there we are. Together. So we got lucky amid our respective craziness and I tp’d to see all the possible ponies that you can rez at Shengri La. We each picked a pony and set off for a gallop. We galloped til we both crashed. 🙂 Hey – it’s like running or working out. Do it til it hurts. No pain, no gain. I love the ponies of Shengri La. Thanks, Shen. This past week has been a very full week. A bit of an emotional roller-coaster. There were definitely some points in this week that were a bit difficult. Things got better, however, as they usually do when you take a moment to breathe in, relax, breathe out. Many good things began happening, with perhaps the most exciting happening at the very end of the work week. I received some feedback on the work I’ve been doing. *grin* Positive feedback, in case you were wondering. I feel extremely happy and proud. I would even say “validated”. In my mind, I see a straight progression from the day I first heard about “SL” to the end of this week. The mind is wonderful that way. 🙂 It can make sense out of anything if it so chooses. I was talking with a friend last night, discussing everything. She made the point that I did the work. Yes, that is true. But in my mind and heart – I could do the work and push forward and stay determined because of my friends. Actually – these people were not my “friend” at the point where they reached out and offered a hand. (They are all my good friends today.) I see many people who could have simply shrugged and said “not MY problem” and ignored me. But they didn’t. Each one of these people made what probably seemed like a simply, easy gesture. But to me, the recipient – the combination of each of those little actions was life-changing. It is so easy to be kind, to be helpful, to be generous. You can’t always see the consequences of your actions immediately. But it could be a life you are saving. I like the meter, I like the simplicity of the message of that nursery rhyme, but I don’t like that it’s a negative approach. I prefer to phrase things postively. Encouragement offered instead of just scorn. Volunteering accepted, a challenge was sown. A task was completed and yes, “face” WAS saved. A new life was picked, confidence still unshaken. And all from the help of my friends.